Supermarket Trips & Slips – Have you had an accident in a supermarket causing personal injury? Slip, trip or fall? Most of us need to visit shops and supermarkets from time to time and generally they are kept clean, tidy and safe. Unfortunately, however accidents sometimes happen. To speak to one of our personal injury solicitors telephone 01925 937070. 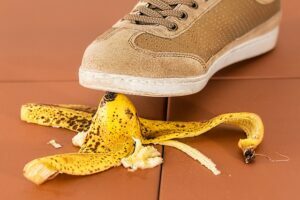 We regularly help clients make supermarket trips & slips accident compensation claims following injuries in supermarkets, usually as the result of a slip, trip or fall, or occasionally because a sign or shelf has fallen onto them. Or possibly because a food or liquid spillage has not been cleaned up properly. Not only can we help you claim compensation for pain and suffering, we can also help you to claim compensation for lost earnings or damage you may have suffered to your clothing or personal belonging as a result of your supermarket accident. We can also help to arrange and recover the cost of rehabilitation such as physiotherapy. If you think you may have a valid claim for compensation following a supermarket accident that was not your fault, contact the team at DSM Legal Solicitors as soon as possible to discuss the details of your claim. For a free, no obligation assessment of your claim call us on 01925 937070, email diane@dsmlegal.co.uk or complete our Personal Injury Claim Form. Why choose DSM Legal Solicitors for your slip, trip or fall accident claim? Our office in Warrington, Cheshire has free on-site car parking, with disabled access, and is minutes away from Junction 8 of the M62. Falling displays or in-store signage which has not been secured adequately to the ceiling or shelving. As a visitor you are owed a duty of care. If you have suffered an injury in a supermarket, you should report the accident to the staff at the supermarket and the staff should complete an accident report form. You should also seek medical advice. The supermarket accident solicitors at DSM Legal Solicitors can provide legal advice on the best way to make a compensation claim. Your claim will be handled by a specialist supermarket accident solicitor, who will ensure that you receive the maximum amount of compensation. Over 90% of the cases we deal with are settled out of court. At DSM Legal Solicitors, we are experienced in bringing claims against supermarkets but if your case doesn’t succeed for whatever reason we will not charge you a fee. We keep you regularly updated using jargon-free, plain English and we take the stress out of bringing a claim. We will fight to get you the best possible outcome. We can assist with personal injury (accident claims), road traffic accidents, medical negligence claims, criminal injury compensation claims, employment law claims, lasting powers of attorney, wills and probate, oaths, affidavits and statutory declarations, settlement agreements and professional negligence claims.